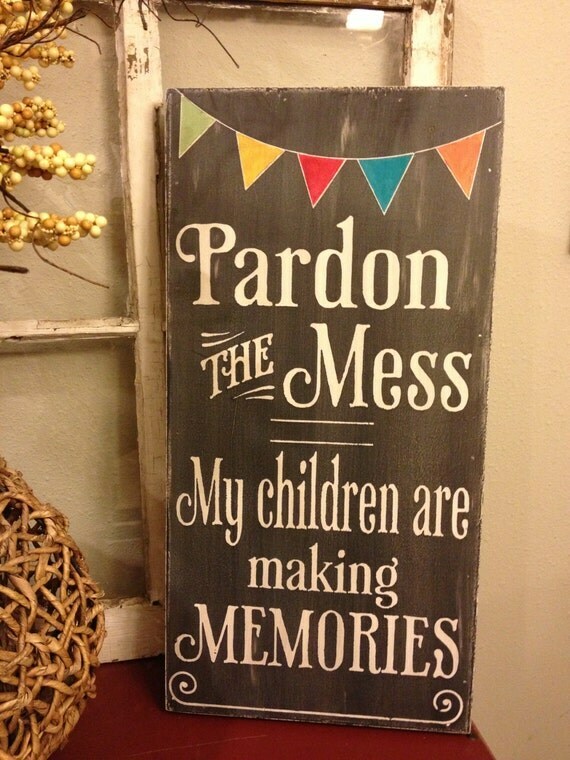 Spoiler alert: Kids have a lot of stuff. 1. Create a library wall. A great way to keep books on your mind and at arm's reach. 2. Use tote bags in place of toy bins. 3. Repurpose plant baskets as storage. 4. Make cute storage drawers. These chalkboard-painted wine crates help keep trinkets together. You don't even need to paint those wine crates for them to look pretty. 6. Make toys do double duty as decor. 7. Add visual aides to help pre-readers stay organized. 9. Turn your games in to colorful artwork. Bonus: Game pieces are stored in a ziplock on the back of the frame making this storage hack both pretty and practical. 10. Give everyone their own station. Never go searching for your toothbrush again! 11. Hang buckets on a rod. The easier it is for your kiddos to put things away by themselves, the more likely it is to happen. What prince or princess doesn't want a clothes chest? 13. ...Or display colorful costumes as art. 14. Turn just about anything into a library. 15. Use food storage containers to separate craft supplies. 16. Opt for themed storage to blend in with the space. 17. Produce a sports center of your very own. 18. Get your whole week organized. 19. DIY these storage bags in whatever size you need them. 20. Make your own hidden storage bags. Get instructions here for storage bags that hang beneath your table. 21. Organize their car collections. Group cars by color for an arty look. 22. Build colorful bookshelves to suit your needs. Another option: Display wine crates and wooden boxes on their sides to create a similar effect without having to use a hammer. 23. Create a coordinated storage ottoman. Check out instructions for a wine crate variety here. 24. Keep magnetic toys in place. Buy a magnetic board—like this one (under $25)—and hang it on a bedroom wall. 25. Use a teepee for private play space when there is none. 26. Get hip to squares. 27. Turn old tires into creative storage. 28. Build this DIY stuffed animal swing. 29. Mix and match storage bins for an eclectic look. 30. Upcycle your tool storage for an industrial vibe. 31. Make a toy car garage out of toilet paper tubes. 32. Build this brilliant bucket pyramid. Learn how to make your own with these instructions. 34. Make your own labels. 35. Turn a bar cart into a craft station. 36. Use a fruit basket as a toy caddie. 37. Ditch the bulky easel and hang paper on the wall. Use an old towel rack to get the look. 38. ...Or create an art corner. 39. Make a "motherboard" to track school paperwork. 40. Establish buckets to help collect runaway toys. 41. Take your kid's LEGO obsession to the next level. Then you can ditch those storage units altogether. 42. Utilize the space under the stairs. 43. Get a double-duty play mat. 44. DIY an accessories organizer. It's easy: Paint a picture frame, secure ribbons to the back of it, and add small hooks to the bottom. 45. Use vintage suitcases for underbed storage. 46. Blend your storage with your style. Make your own with these instructions. 48. Forego notepads and write on the walls. 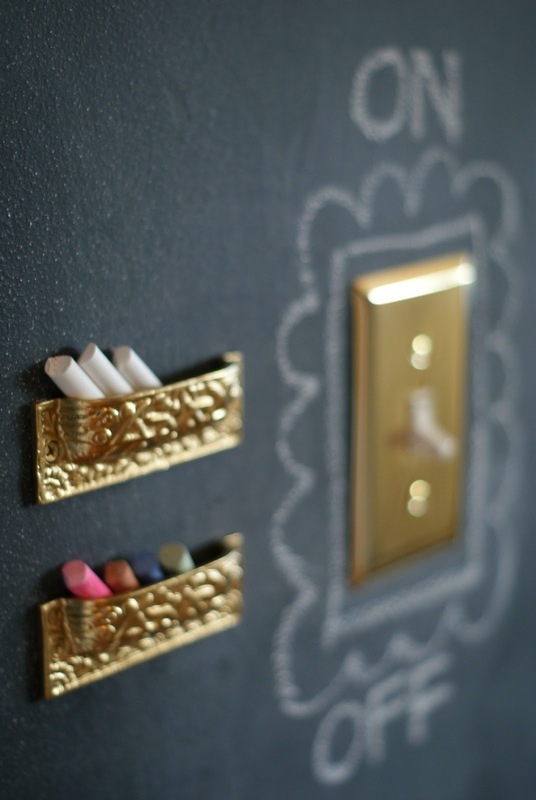 All you need is a few cans of chalkboard paint!